Manufacturer & Trader of Pot Rack. Our product range also comprises of Barbeque Grill, Refrigeration Equipment and Cooking Equipment. Our organization takes pleasure to introduce its business as one of the leading entity offering Pot Rack. 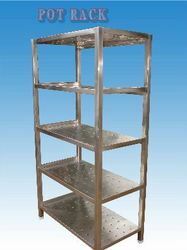 This rack finds wide application use in eateries, restaurants, hotels, commercial kitchen and food stalls. This rack is manufactured adhering to industry norms. Stainless steel alloy and corrosion resistance parts offer better storing experience with safety assurance. Also, this rack is tested on various quality parameters to ensure optimum performance of the rack. Besides, clients can get the rack from us at industry leading prices. Looking for Pot Rack ?